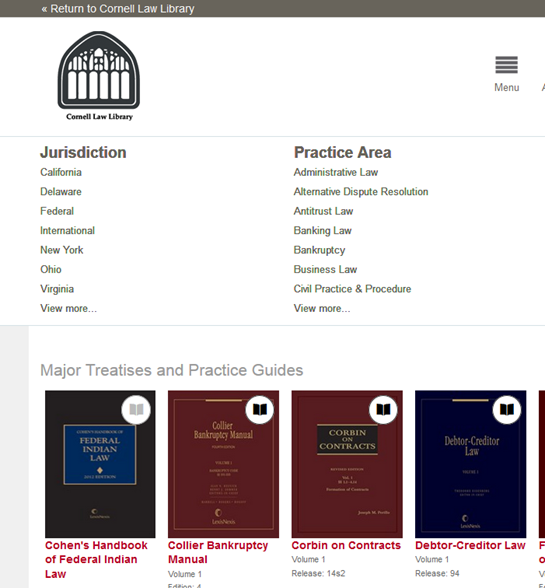 We’re pleased to announce that we’re implementing the innovative new LexisNexis Digital Library (http://cornell.law.overdrive.com), which offers some of our more frequently used treatises and practice guides in eBook format. Law s tudents, faculty and staff can check out and return titles via the Digital Library website on your work or home computer (PC or Mac) or using your mobile device. Once an eBook is checked out, internet access is not required to read the eBook, only to access embedded links. You may use the Overdrive Read function to download eBooks directly into your web browser, or you may download titles to your preferred eReader software or device. All the titles available in the Digital Library will also remain available at the Law Library in print. To sign into the Digital Library, enter your NetID and password. For more information on using the Digital Library, please see the attached information sheet, see our website, or contact Nina Scholtz, Digital Resources Librarian. Executive Branch Documents: Includes nearly all of over 200,000 executive branch documents from 1789-1909 not included in the U.S. Serial Set, as well as an additional 200,000 titles from 1910-1932. Executive Orders and Presidential Proclamations, 1789-Present: The only place you can access a complete collection, both numbered and unnumbered, including those published in the Federal Register, and many more that were not. o Access to Legislative Insight, with over 18,000 legislative histories. For more information about ProQuest Congressional, please contact Nina Scholtz, Digital Resources Librarian. The Law Library is pleased to announce that current Cornell faculty, students, and staff may now create Financial Times (FT.com) online accounts at no charge. To create your account, while on campus (using either Cornell eduroam or Red Rover, or a Cornell hard-wired computer), navigate to https://registration.ft.com/corporate/signup/Oaq41Sl2OoGmS (popup enabling not required) or to http://www.ft.com/home/us (popup enabling required). You should see a message inviting you to sign up to Cornell University Library’s subscription. Follow the directions to register, using your Cornell email address ([your NetID]@cornell.edu). You cannot register with a non-Cornell email address. Is there a mobile app I can use? Yes! The FT web app is available for iPads, iPhones, Androids, and Windows phones) for no additional cost. Please go to apps.ft.com for more information. NOTE: The iPad and iPhone web apps are not downloaded via the app store. Can I set up alerts? What other tools can I use? Sign up for email briefings and create custom alerts. Save, organize and share articles via the FT clippings tool. Use FT Newslines, a tool that lets you make notes on FT.com articles. What is FT Newslines? How do I use it? Newslines is a tool that allows students and professors to interact regarding important topics and news of the day on FT.com. Please read the Quick Start Guide for Professors for more information. Students can read the Quick Start Guide for Students. Questions? Please contact Nina Scholtz, Digital Resources Librarian, at nes78@cornell.edu. The Law Library offers a free group digital subscription to the New York Times online (http://www.nytimes.com/) for current Law School students. If you haven’t already, you should expect an email from help@nytimes.com inviting you to set up your free access using our subscription. 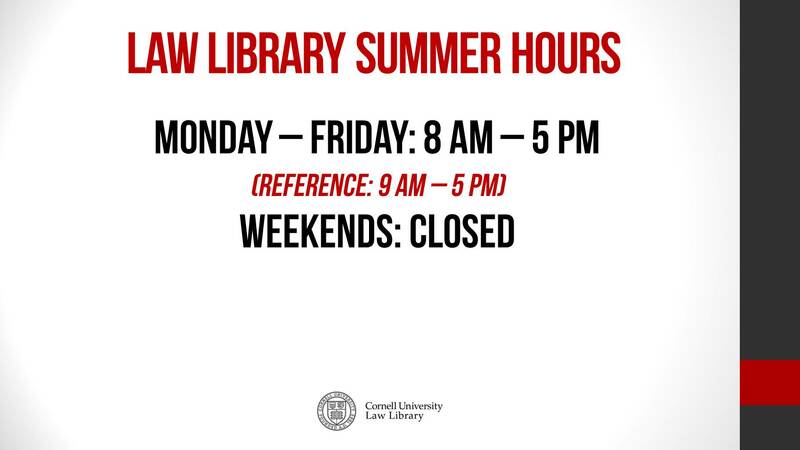 Please note that you must use your Cornell NetID email address (e.g. js123@cornell.edu) to set up your access. Do not use an email alias (e.g. johnsmith@cornell.edu). If you already have a paid New York Times subscription, you will not receive this email. You are, however, still eligible to switch to the Law Library subscription. Nina Scholtz (nes78@cornell.edu), the Digital Resources Librarian, manages the Law Library subscription. Please contact Nina with any questions about the subscription or if you want to switch from your paid subscription. The American Law Institute Library includes the Restatements of the Law and associated drafts. Restatement topics include Agency, Business Associations, Conflict of Laws, Contracts, Economic Torts and Related Wrongs, Employment Law, Foreign Relations Law, Information Privacy Principles, Judgments, Law Governing Lawyers, Law of American Indians, Property, Restatement in the Courts, Restitution and Unjust Enrichment, Sales of Land, Security, Suretyship and Guaranty, Torts, Trusts, Unfair Competition, and U.S. Law of International Commercial Arbitration. Some topics are still in draft form only – but those drafts are included! This Library also includes ALI Annual Reports (1937-2010), Proceedings of ALI Annual Meetings (1923-2011), ALI Annual Meeting Speeches (1923-current), ALI Reporter (vols. 1-33), Statement of Essential Human Rights Archive, Principles of the Law, Uniform Commercial Code (including drafts), Model Penal Code (including drafts and other miscellaneous documents, 1951-2011), ALI-ABA Periodicals and other ALI documents. History of Bankruptcy: Taxation and Economic Reform in America, Part III includes legislative histories, treatises, documents, and other materials related to bankruptcy law in America; books dating back to the late 1700s; and links to scholarly articles useful in the study of bankruptcy law. The U.S. International Trade Library includes more than 4,000 publications from the U.S. International Trade Commission, dating back to 1951; legislative histories of free trade agreements and trade statutes; more than 200 books about international trade; United States Court of International Trade Reports (1980-current), and other materials. Women and the Law contains nearly 500,000 pages from books, biographies, and periodicals about women’s roles in society and the law. It also includes more than 70 titles from Emory University Law School’s Feminism and Legal Theory Project. Remember that HeinOnline databases include images of the original publications and allow full-text searching across each library. We’ve also just purchased a large collection of law e-books from the publisher Edward Elgar. They’re full-text searchable and include easy PDF downloads of chapters using the platform ElgarOnline. Click “Law-Academic” in the left column for the full list of over 400 e-books, then narrow to your chosen subject using the subject list in the left column. New titles will be added throughout the year. Another newly available database is voxgov. As the publisher explains, voxgov provides access to “unfiltered original source news, media and information direct from all branches of the U.S. Federal Government,” including Facebook and Twitter posts from legislators and others. Save your searches and set up email alerts by registering for a free myvoxgov account. Carrel signups will be next Tuesday and Wednesday, September 3 and 4. Carrels located on the first, fourth, new ground, and basement floors may be reserved for one semester at a time by 2Ls, 3Ls, LLMs, and exchange students. Carrels located on the second floor may not be reserved and are available daily on a first-come, first served basis. All carrels are numbered. A carrel map will be made available with the signup form for easy identification. Each carrel must be shared by two students. Students may select a carrel partner or choose to have the library assign one. Tuesday, September 3: Reserved for students who are serving on journals, moot courts, or working for a professor. Wednesday, September 4: For the remainder of the students identified above. Please see Janet Gillespie in room 352 between the hours of 8am-12pm and 1pm-5pm on the appropriate day. Questions may be directed to Janet at jmg32@cornell.edu or 607-255-5854. Supreme court blogs: Going beyond the U.S.
Australia’s Opinions on High just went live on July 31. Described in the press release as the “first comprehensive Australian academic legal blog dedicated to the proceedings of Australia’s High Court,” the blog is based at Melbourne Law School. Follow the blog on Twitter: @opinionsonhigh. Canada has The Court, “a site where scholars, practitioners and other interested citizens can discuss the recent work of the Supreme Court of Canada” (http://www.thecourt.ca/about-us/). Osgoode Hall Law School students edit the blog. New Zealand Supreme Court Blog was launched in 2011 by New Zealand law students to cover the Supreme Court of New Zealand; its current editors are Sam Bookman (University of Auckland) and Asher Emanuel (Victoria University Wellington). Students, practitioners, and academics all contribute to NZSC Blog, which can be followed @nzscblog. South Africa’s Constitutional Court (its highest court on constitutional matters) is covered by ConCourtBlog.com. South African lawyers and legal researchers are the editors and contributors. The blog includes statistics and justice profiles. United Kingdom solicitors and barristers maintain UKSC Blog. It covers the UK Supreme Court from a variety of angles, with case comments and previews, news stories, and feature stories. Cornell University has always been “an institution where any person can find instruction in any study.” Professor Kevin Clermont‘s new book, The Indomitable George Washington Fields, is about Cornell Law School’s first African-American graduate, who received his law degree in 1890, having entered with the school’s very first class in 1887. Fields was, indeed, indomitable: He was born a slave but escaped from slavery with his mother and siblings during the Civil War. He attended Hampton Normal and Agricultural Institute (now Hampton University) and then, after working both in the south and the north, Cornell Law School. 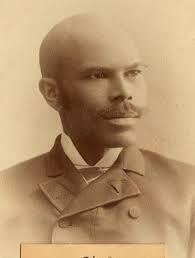 After returning to Hampton, Virginia, he practiced law for forty years until his death in 1932. For most of his years in practice he was blind as the result of an 1896 accident. The details of Fields’ life, while fleshed out by Clermont in the first part of the book, are primarily presented in Fields’ autobiography, a transcript of which is included in the second part of the book. Clermont found the manuscript autobiography at the Hampton History Museum after his interest in Fields was piqued by Fields’ thesis advocating abolition of trial by jury. The thesis is also included in Clermont’s book. Clermont’s book may be purchased on Amazon.com either as a Kindle e-book or in print. The book may also be read on ISSUU.